History has shown us that when a new tech industry emerges, a handful of companies struggle to own the largest market share, but only one or two lead the sector. A time like this reminds us of the “race-of-the-telcos” in the early 2000s and the “war-for-ecommerce” in the 2010s. Who will capture the Nigerian Digital Financial Services Sector? In the last three years, over 20 million dollars was raised among fintechs in Nigeria. Our payments sector is one of the largest in Africa with many of the companies reporting transactions worth a billion naira per annum. Many payment-processors have sprung up in recent years to help speed up the shift to a cash-lite society. New-age fintech products are being powered by either Flutterwave, Interswitch and Paystack (FIPs). Some even make use of a combination of them. The FIPs have made it easier for startups like Piggybank and PayLater to offer unbundled banking services at scale. The new ease of accepting payments from many channels has led to the continuous rise of fintechs. Thereby making it a little overwhelming for the average consumer to keep up. Customers ask: "which product does what? and how does it compare to products in the same category?" Investors are asking: "what are your unique offerings? and who are the people behind this? how much have you raised?" This article attempts to give an overview of the current fintech landscape in Nigeria and the fields in which they play. Bear in mind that while these platforms have intersecting offerings, they differ in vision and execution. Everybody has a need to move money around. Businesses need to pay salaries, a subsect of their laundry list of bills. Parents need to pay for school fees and customers need to shop (online or offline). Market women need to contribute their weekly savings (Ajo) to the collector (Baba Alajo). Below are some of the key players in the local “intra-Nigeria” transfer space. Paga is a local money transfer platform with more outlets than the total of all bank branches in Nigeria. They have managed a near-nationwide coverage by partnering with Nigeria's Postal Service (NIPOST). This partnership affords them an outlet in each of the 774 local government areas in Nigeria. As at 2015, they had over 3 million users, with over 800,000 active, and over 8,000 agents in 35 states across Nigeria. Also, they raised 13 million dollars to strengthen their agent network and build a more robust infrastructure. This makes them one of the most funded startups in this space. Unlike other online mobile payment solutions, their offline-first approach has enabled them a wider reach. The dust is yet to settle on the exit of Etisalat from the Nigerian market but the debris has begun to pick themselves up. The rebranded company 9-mobile has launched 9pay. 9Pay is not owned by 9Mobile. It is a financial service product of Novacrest Solutions Limited, that is powered by 9Mobile and supported by UBA. We speculate that for Novacrest a partnership with a telco would ease their CAC. CAC - customer acquisition cost. Because, said Telco will help drive marketing to their existing subscriber base. Of the four telcos in Nigeria, 9Mobile has the smallest subscriber base - 16.3M. Yet, if Novacrest is able to get just 10% of 9Mobile subscribers to become active users of the platform, they'll easily become the biggest fintech. They are using a time-tested (less secure?) technology -- USSD. Users can dial *500# to fund their wallet, and then proceed to make financial transactions. But, UBA could decide to pull a GT Bank (GTPay) on them by partnering with other telcos to launch a UBAPay. The history of KongaPay is as old as that of Konga itself. It was designed to help merchants and buyers transact more fluidly. The platform had integrations with major banks in Nigeria like Zenith and GT bank. Effectively, a buyer could draw money from multiple bank accounts to fund their KongaPay account. The reverse is also true; you could pay-out into many bank accounts. KongaPay has expanded even further. In its current iteration, it has become a platform to pay bills. It's about the earliest second-generation merchant payment-processor after the likes of Interswitch. There are few products that give the opportunity to reach millions and improve their quality of life instantly like Eyowo - a financial service platform for the banked and unbanked in Nigeria. By dialling a short-code – *4255# mobile phone subscribers automatically get access to their wallets. 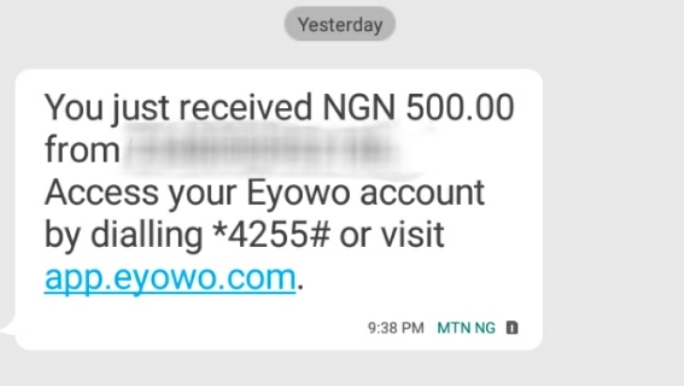 Yesterday, I received 500 naira from Eyowo, processed by one of their staff, without making any registration prior. He just asked for my number and I got an alert. The money can be collected at a any ATM with the cardless feature. It can also be transferred to a bank account or sent to another phone number. Too, expect the usual payment features like buying airtime, and paying bills. The product comes after a successful collaboration between a Bank and a technology solutions company (more on this when they are live). What is more interesting is the possibility of this product. Founder of NairaBet, Akin Alabi while chatting with Dotun Olowoporoku, Build the Future Podcast Host mentioned that being able to fund your betting wallet from the comfort of your feature phone will cause a rippling effect. As a benefit, betting companies will then be able to easily bypass agents and the trouble that comes with them acting as betting proxies. Also, if such happens, Nigeria will be an inch closer becoming a cash-lite economy. Everyone is going to win and Eyowo seems to be a viable vehicle to happiness. With 50 million unbanked Nigerians and over 120 million active telephone lines, there is no stopping this product. Except, of course, the quality of the product itself and its marketing efforts. Other companies that fall into this category of local money transfer include dotbank, payant, and monapay. Many international companies incorporated in Nigeria report that they experience difficulties when trying to pay their international staff. A co-founder of Big Cabal Media, Mr. Bankole recently shared his experience of having to travel to Kenya to pay writers of the firm residing there. Also, the CEO of Flutterwave -- Iyin ‘E’ Aboyeji - explained that one of the reasons for starting his company due to his experience at Andela where they had to ‘ship’ staff salaries to other African countries. International money transfer is not just about moving money between African nations, it also involves receiving from individuals outside the continent. In March 2018, Pew Research published an analysis of UN's Emigration Data stating that 8 in 10 of the fastest-growing populations are from Sub-Saharan African countries. Population growth means people will migrate, seeking newer adventures. In recent years, the destination has been to a North American country, Canada. The country introduced an Express Entry Program in 2015 to help balance their labour force. “Stressed-out middle-class” Nigerians (among other nations) have since capitalised on that and are leaving the country in droves. The research confirms that at least “a million Sub-Saharan Africans moved to Europe since 2010”. Ken Research published in January found that Nigeria, alone, receives 67% of all international remittances coming to sub-Saharan Africa. Helping Nigerians (and Africans) move their money is both a duty-call and an industry ripe for disruption. Here are some companies working on this noble cause. Opera, whose mobile browser -- Opera mini dominates the Nigerian browser market is not resting. With the $100 million budgeted to fast-track the growth of Africa’s digital economy they are delving into new territories and payment is one of such. With Opera’s audience, they are in a good position to build a seamless pan-African mobile-money engine having launched Opay in Nigeria and Kenya. The game is afoot. Beating restriction on international e-commerce is the end-game for most players in Nigeria. Payment businesses like Barter exist to make this seamless. Backed by the partnership put-in-place by Flutterwave, Barter has launched in Nigeria, Kenya and Ghana. It is a virtual card that accepts Nigerian naira which can then be used to pay for local and foreign transactions like Apple music and Netflix subscriptions. Barter cards is playing in a space where naira-denominated debit cards are limited - paying for foreign transactions (usually in dollar or pounds). This Dollar virtual card is also one of the Unique Selling Points (USPs) of Wema bank's Alat.ng – a fully digital bank. Chat automated payment platform, Kudi.ai, allows users to perform financial transactions via instant-messaging interfaces like that of Messenger, and Telegram. Their platform enables users to pay for bills and tickets to events. Adeyinka Adewale, one of the founders, shows he is not a newbie to the payments space as he had previously co-founded a payment product intended for universities, Sanwo Touch2Pay and Kudi.ai was just affording him a larger platform. Kudi.ai which is also a graduate of YCombinator (like Paystack and Flutterwave) participating in the Winter 2017 batch has raised seed funding from local and foreign investors. They recently announced the processing of more than 1 billion naira in the first quarter of 2018. They include UBA’s Leo, Access bank’s Ada and Stanbic IBTC’s Sami. 2018 has seen banks launch digital banking assistants. First, we saw the launch of award-winning Leo by UBA, followed by Ada by Diamond, later, Stanbic IBTC ran to market with Sami. These services help customers perform financial transactions like money transfer, and airtime purchase via chatting platforms like Facebook's Messenger. They are slowly coming to terms with Bill Gates infamous quote that “in the future, Banking will be needed but banks will not”. Aela Credit, Paylater, Cowrywise and Piggybank are performing large volumes of transactions eclipsing previous year’s metrics easily. With the recent investment of 1.1 million dollars in Piggybank, Paylater's PayVest announcement, CowryWise’s raise and acceptance into the much-coveted startup program - YCombinator, the race to market dominance is still very much aloof. Players will need to stand the test of time and come forth with their score card in a few more years. We are going to see more bank-fintech collaborations in the future. Plus a lot more bank evolvements with digital as their core strategy. What a time to be a Nigerian Fintech Enthusiast! There are six traits of sticky, viral messages. Social media platforms like Whatsapp are at the fore of disseminating this information. Now, they are faced with managing same.